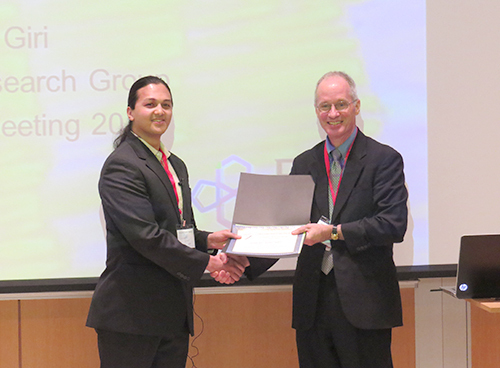 CHESS Director Joel Brock was pleased to announce this year’s winner of the CHESS Student Paper Prize as Gaurav “Gino” Giri . Gino, a graduate student of Zhenan Bao at Stanford and then post-doctoral associate at MIT in the group of Klavs Jensen, proceed to explain his work entitled "Understanding Organic Semiconductor Polymorphism using High Speed in-situ Optical and X-ray Diffraction Methods”. Starting this presentation he acknowledged and thanked coauthors Ruipeng Li and Detlef Smilgies (CHESS), Aram Amassian (KAUST), and Zhenan Bao. Gino Giri receives award from CHESS Director Joel Brock. CHESS news readers might recall that two years ago Gino was highlighted for winning the 2013 Melvin P. Klein Award for his work on solution shearing of organic semiconducting molecules. That award recognizes outstanding research accomplishments by students and postdocs at SSRL and intends to promote dissemination of research results. Gino was then in the midst of working under Zhenan Bao in the Department of Chemical Engineering when he approached KAUST collaborator Aram Amassian and CHESS Staff Scientist Detlef Smilgies an outrageous experiment: watching organic thin films crystallize in-situ and in real-time during the solution shearing process. During this process a drop of solution is spread with a coating knife at a specific speed (see figure); coating gap, concentration of solute and substrate temperature also determine the thickness and quality of the resulting film. The idea grew out of Gino’s prior extensive work at SSRL to analyze shear-coated molecular films after deposition which led to the discovery of a strained TIPS-pentacene polymorph with very high mobility. That prior work resulted in a letter to Nature . He points out, however, that it is difficult to study in-situ the morphological and polymorph formations responsible for high organic thin-film transistor (OTFT) performance. Not only does the thin film crystallize at a fast time scale, the evaporation front, where the crystal grows from the solution, is very small. The entire evaporation front can be less than 200 microns. Thus, the solution evolves into a crystallized thin film within seconds, and within an area less than 0.2 mm wide. Their solution was to use an X-ray ‘microbeam’ at the CHESS D1 station with a beam width of < 20 microns, in conjunction with a high speed detector to resolve and follow crystallization from solution during shearing. 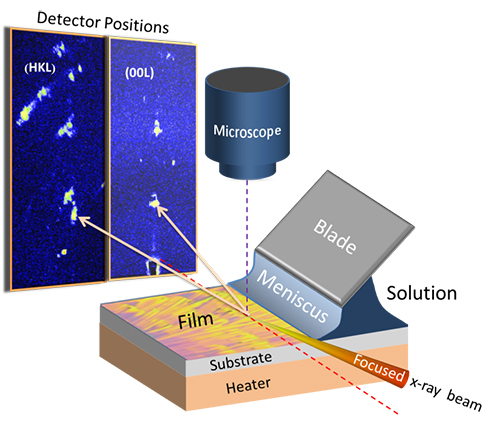 They collected up to 100 X-ray frames per second, and were able to create grazing incidence x-ray diffraction movies to easily see how crystallization occurs in the solution shearing system in real time. They also used an optical microscope trained at the evaporation front to collect optical videos of the evaporation front at up to 10,000 frames per second. He explained that being able to simultaneously study kinetic crystallization using both optical and X-ray movies helps understand how different processing conditions result in various polymorphs. Several model systems show that confinement of the growing thin film plays a key role in forming metastable polymorphs, and that the film formation proceeds downwards from the air-solution interface. They generated metastable crystal polymorphs through other solution processing conditions as well. This is the first time such a fast rate of data collection has been utilized for grazing incidence X-ray diffraction. Schematic of the solution shearing experiment: A drop of solution of the organic semiconductor is spread with a blade at well-defined gap and speed. At the edge of the meniscus the film solidifies to form at 50-100 nm thick coating. Film formation is imaged optically with the sample microscope. The film is probed with an x-ray microbeam and scattering images are collected with a fast area detector. For details see . Gaurav Giri, Ruipeng Li, Detlef-M Smilgies, Er Qiang Li, Ying Diao, Kristina M. Lenn, Melanie Chiu, Debora W. Lin, Ranulfo Allen, Julia Reinspach, Stefan C. B. Mannsfeld, Sigurdur T. Thoroddsen, Paulette Clancy, Zhenan Bao and Aram Amassian: "One-dimensional self-confinement promotes polymorph selection in large-area organic semiconductor thin films", Nature Communications 5, 3573 (2014). G. Giri, E. Verploegen, S. C. B. Mannsfeld, S. Atahan-Evrenk, D. H. Kim, S. Y. Lee, H. A. Becerril, A. Aspuru-Guzik, M. F. Toney, and Z. A. Bao, "Tuning charge transport in solution-sheared organic semiconductors using lattice strain," Nature 480, 504-508 (2011). Detlef- M. Smilgies, Ruipeng Li, Gaurav Giri, Kang Wei Chou, Ying Diao, Zhenan Bao, and Aram Amassian, "Look fast: Crystallization of conjugated molecules during solution shearing probed in-situ and in real time by X-ray scattering," Physica Status Solidi - Rapid Res. Lett. 7, 177-179 (2013).